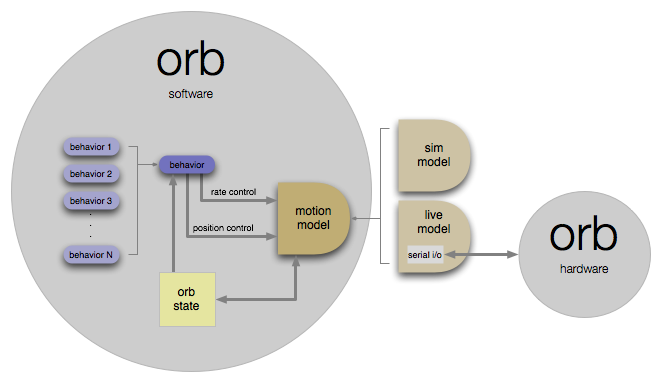 The Mother Node is PC/Linux/Mac software to control the Orb Swarm from the Mothership. Mac OS: the group on /var/lock needs to be changed to "uucp"
Linux: it may be necessary to install RXTX lib. A version the librxtxSerail.so is packaged into the mother node software. If it does not load and run properly, it may not be compatible with the version of the Linux you are running, you should see errors in the output of the program to this effect. In this case you will need to install the correct version of RXTX into a location that appears in LD_LIBRARY_PATH or DYLD_LIBRARY_PATH. USB hub(s) will probably be needed. There have been issues with joysticks switching which orb they are connected to. There has been some discussion about possible under-volt conditions with many joysticks. Powered USB hubs might be a good choice. On most systems you can also double click the jar file to run it. Edit the properties file in your home directory to control behavior of the program. You will need to restart the program after you make changes to the properties file to see the effects of your changes. There are two Mother Node efforts SwarmCon and DashBoard. The executable swarmcon.jar can be downloaded and run. It has been tested on Mac OS X (10.4) and Windows (XP). Please give it a try on your system and let me know how it works. Messages are passed between orbs, joysticks and the mother node. The following is intended to be a complete list of these messages. At the time of this writing not all messages are implemented. Those messages are marked with "*", an asterisk. A Java Runtime Environment (JRE) version 1.5 or later. I recommend Java Runtime Environment (JRE) 6u1. A Java Development Kit (JDK) version 1.5 or later. I recommend JDK 6u1. Apache Ant version 1.7 or later. Not all of the build targets have been tested. Python http://www.python.org/ platform-independent object-oriented programming language. Many people I trust swear by it. Very powerful, readable, has modules to support pretty much any computational need. You need these setup files to run the Dashboard. wxPython for Python 2.5 http://www.wxpython.org/download.php Get the "Docs, Demo, Samples, etc." too. wxPython: http://www.wxpython.org A popular cross-platform Python GUI toolkit for Windows and Unix (including Mac) with native look and feel on each platform. Free, open-source, includes joystick module, graphics canvas, controls, just about anything anyone might need, all nicely integrated with Python. Download - http://www.wxpython.org/download.php Get the "Docs, Demo, Samples, etc." too, you want them. This page was last modified on 11 November 2008, at 22:46. This page has been accessed 111,289 times.